"Bruno" hits the catwalk in Milan. When Sacha Baron Cohen tried to invade the Versace show during Milan Fashion Week as his alter ego Bruno, Italian fashion authorities were pissed. Security blocked him from Versace and the Italian Chamber of Fashion sent out a press release urging designers not to let anyone affiliated with his production company into their shows. When he managed to walk the runway at Agatha Luiz de la Prada's show, security chased him down and the lights were dimmed. This was clearly not a joke to the Italians. But it was to the French! Bruno met a far different fate in Paris, easily infiltrating Stella McCartney and Jean-Charles de Castelbajac's shows. McCartney seemed to be in on the joke, though she pretended she wasn't. "I love his work in fashion," she told WWD. Bruno's production company called De Castelbajac the day before the show and told him Jude Law was coming. Alas, Bruno showed up clad entirely in leather. “When my security asked if he should be removed, I said, ‘No, let him do his film,’ which turned out to be kind of a cool performance. He was part of the show, a superguest,” de Castelbajac said. The designer was impressed by his models’ unblinking demeanor in the face of Bruno’s attempts to interrupt the action. The French seem to have a greater sense of humor than the Italians, God bless them. Bruno is reportedly off to Moscow Fashion Week next. We hope he runs around clad entirely in Swarovski crystals. 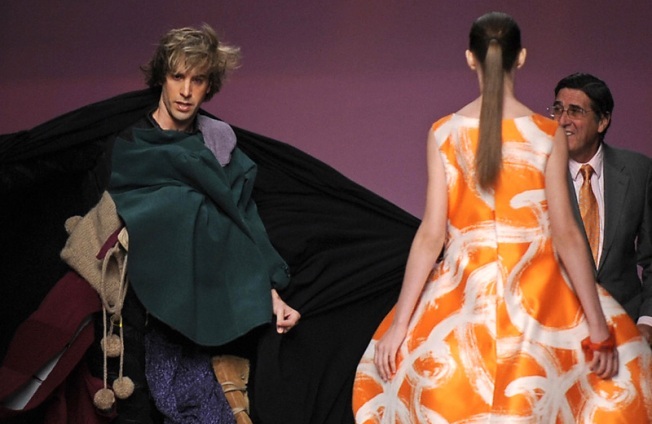 Video: Sacha Baron Cohen Wreaks Runway Havoc Again!